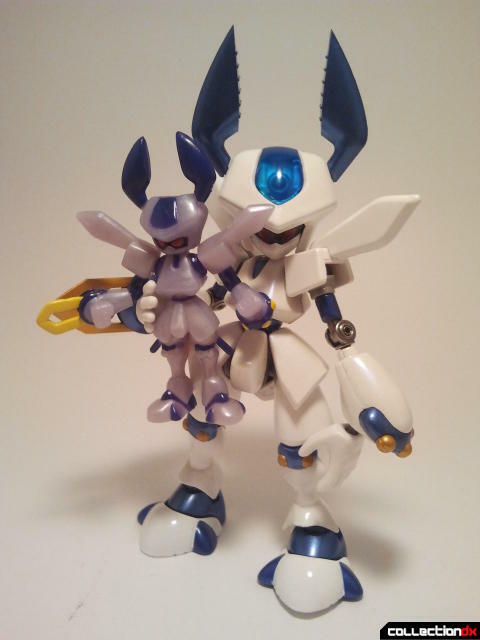 The figure was provided by HobbyLink Japan. Get your D-Arts Rokusho there! 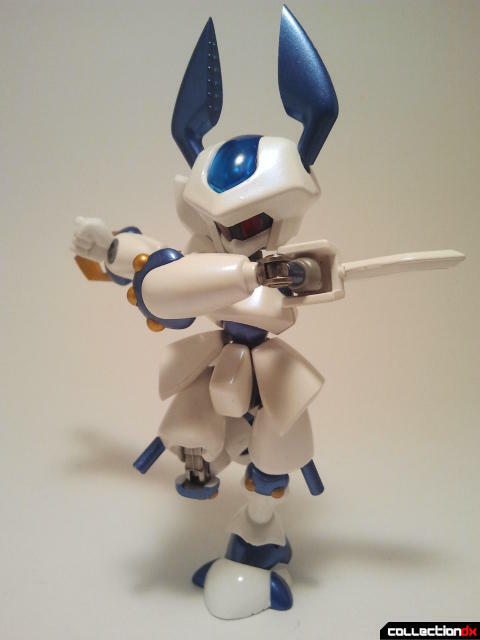 As a huge Medabots and Rokusho fan, I’ve always wanted a really nice posable action figure of Rokusho. The closest thing I had to this when I was a kid was the Rokusho model kit that was released in the US, (which you can take a look at right here!). 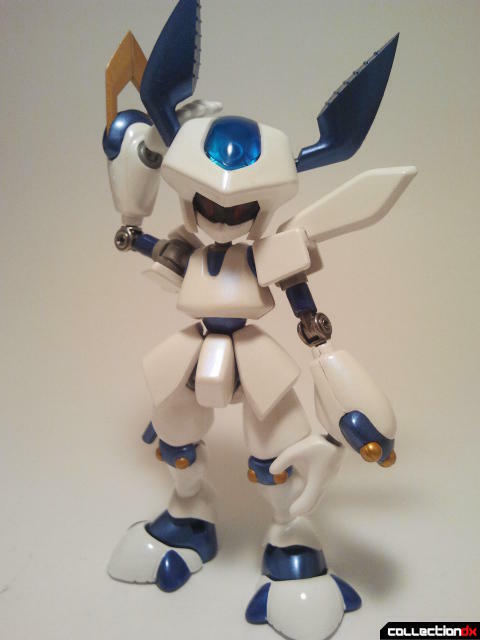 It was a cool toy, but the armor always popped off when I was playing with it and it ended up being really fiddly. My options otherwise were pretty limited to the smaller Rokusho toy, and a few random action figures. It was always disappointing for me that Rokusho was a character who I couldn’t have that perfect toy of. Well, it’s 2012 now, and it may have taken about ten years, but I finally have my perfect Rokusho. 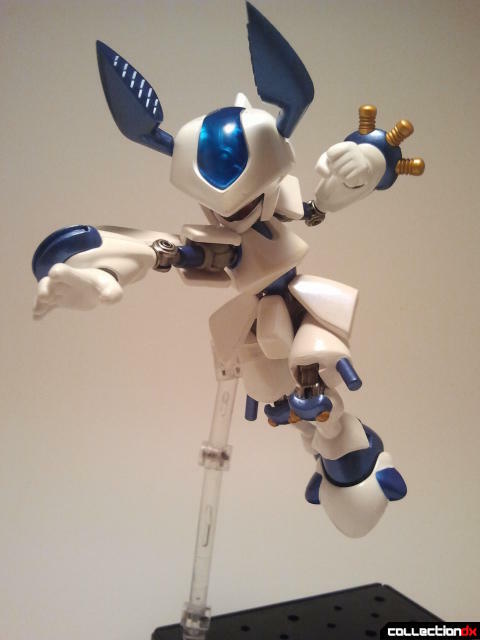 Rokusho is the second Medabots character to appear in the D-Arts line, a line focused on video game characters. 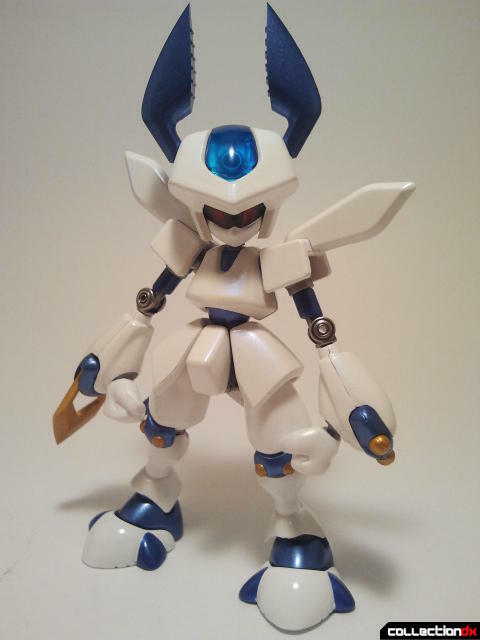 This version of Rokusho is a bit of a mix between his video game design and cartoon character design. He’s noticeably whiter and bluer than the anime version. That’s not bad though, as it really helps give him a blazing presence where he stands. Out of the package Rokusho was actually a little bit slippery. 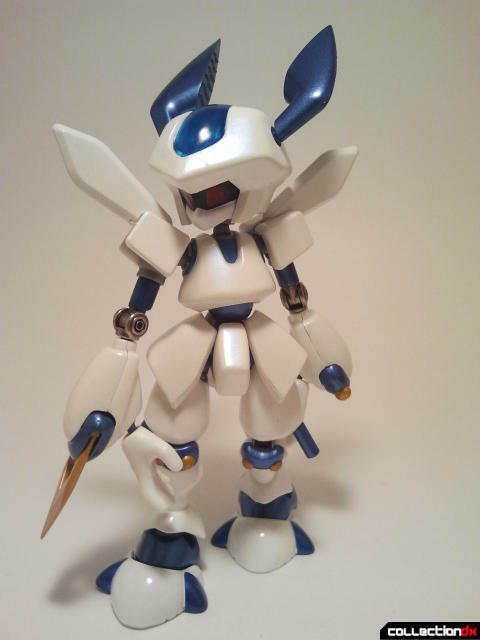 I attribute this to the fact that all of the white on Rokusho is actually a super glossy and shiny paint. There’s a blue metallic flake in the paint as well that makes this toy shine in natural sunlight. Before doing anything with Rokusho though, he needs to have his medal inserted into his back. It’s a simple piece of plastic painted gold. In retrospect, it would have been really cool of these medals were actually tiny pieces of diecast. Rokusho’s articulation is pretty fantastic. 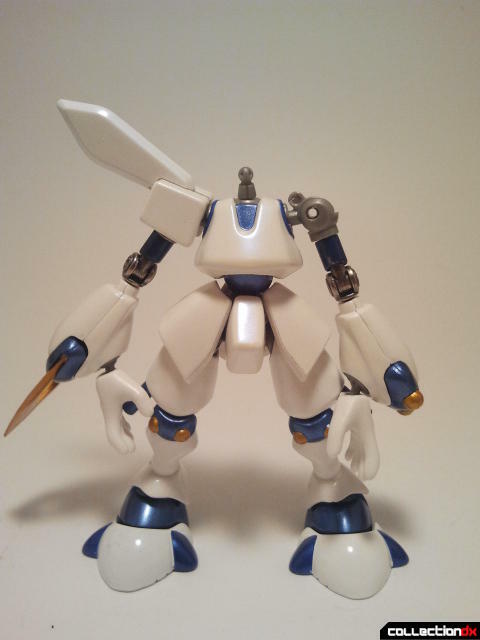 Most of it is standard fare for a Bandai collector line: double jointed neck, knees, wrists, arms, and more. 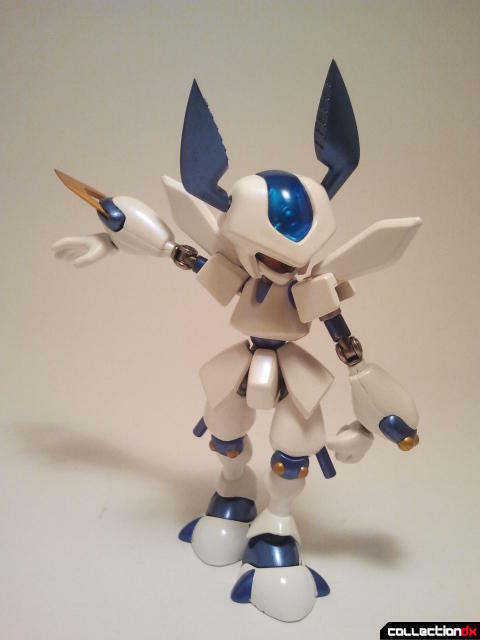 His elbows, knees, and feet are also diecast and add a bit of heft to this otherwise small and lanky little robot. He has a fantastic ankle tilt on his feet that lets him get in plenty of wide-legged dynamic poses. 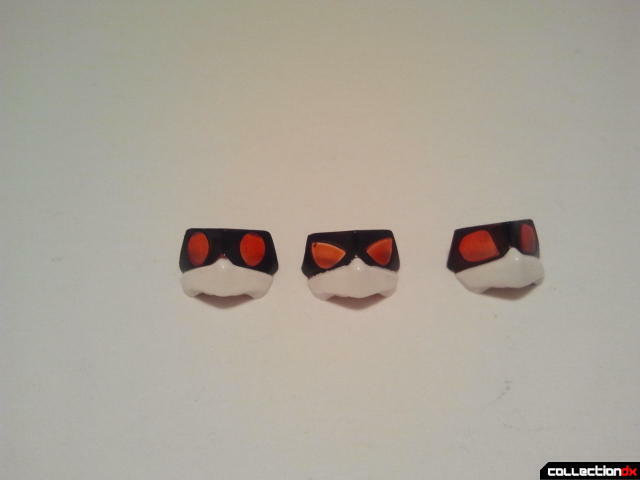 Rokusho also comes with several swappable faces as well. He has a set of wide round eyes, default eyes, and a pair of angry glaring eyes. Oh my God. WHAT’S WRONG WITH YOUR FAAAAAAAAAAAAAAAAAAAAAAAAAAAAAAAAAAAAAAAAAAAAAAAAAAAAAACE. … And of course, ticked off and ready to tear your face off. 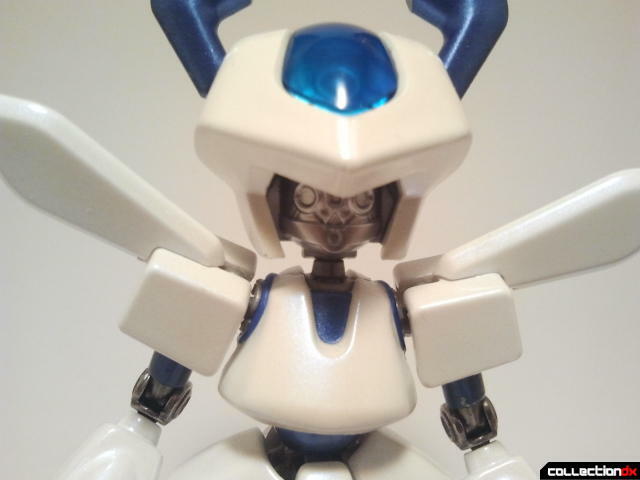 Rokusho’s antlers are actually on ball joints. Although at first I thought that it was rather silly to make them emotive, I’ve since found that these antlers make posing Rokusho a joy. They really add a lot of emotion and life to any pose you put him in. The biggest accessory that Rokusho comes with is his tattered cape. Unfortunately this cape takes a bit to work to get it onto Rokusho. First you need to remove his left shoulder pad and his head before fitting the cape into place. 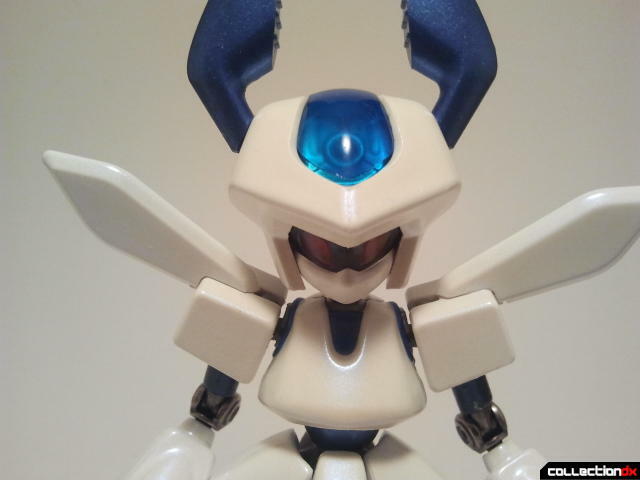 The ball joint on the head also needs to be swapped out for a slightly longer one. A set of two are included in case you lose one of these incredibly tiny pieces. The cape is a giant whack of PVC plastic that fits over him. 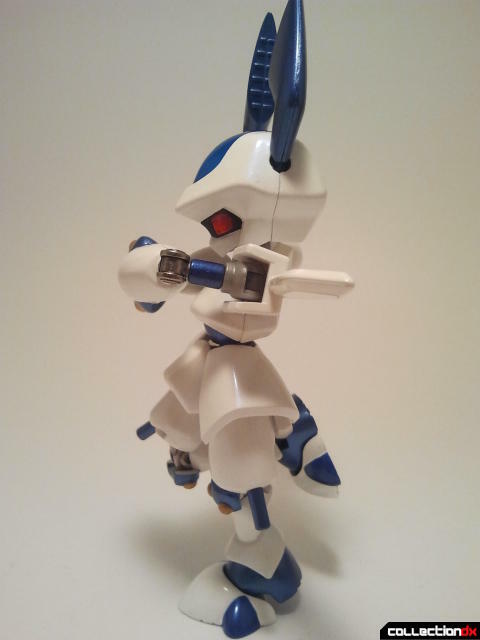 Rokusho can’t do much with it on though, since it limits his legs and left arm. He can stand there and look pretty awesome with it. I’ve mentioned before that Rokusho’s first appearance in the anime was with him in a cape on. To include this cape with Rokusho is just such a nice extra touch. Once the cape comes off though, it’s time for Rokusho to get serious. With his Chanbara Sword and Hammer, he will beat your face in. An alternate hidden sword and extended hammer are included to finish off those perfect poses. 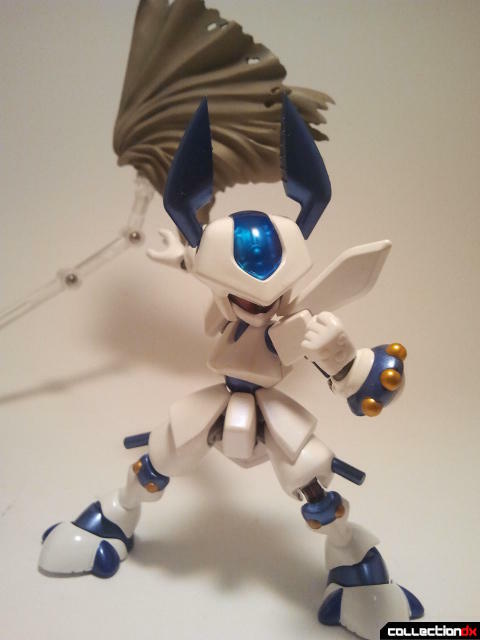 His sword even opens in order to make his weapon clamp down on people: another tiny stag beetle motif that I love. 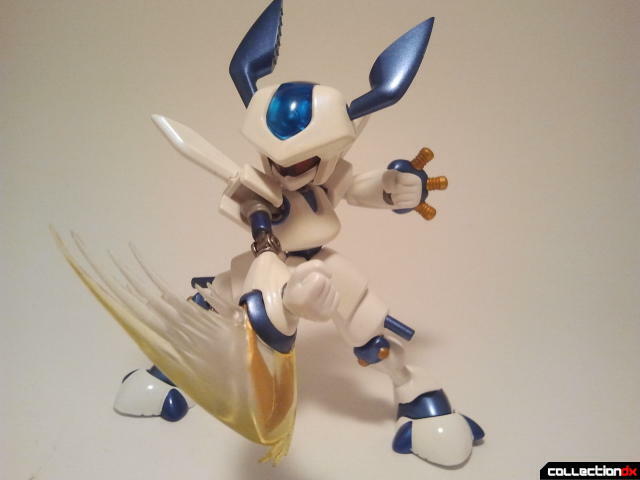 Like Metabee, Rokusho also includes an effects part, in the form of a slashing piece. 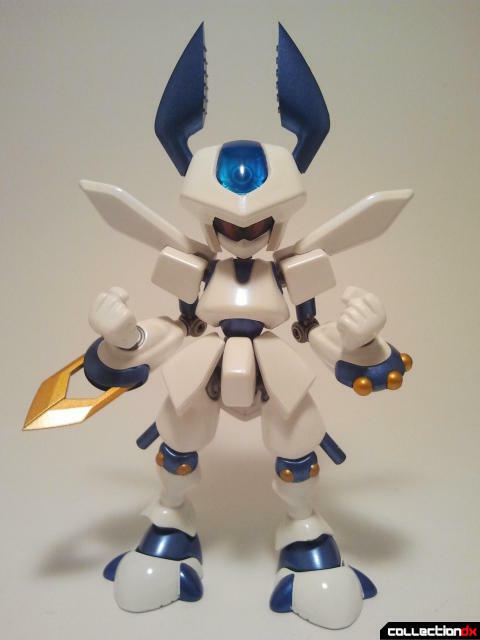 It fits right over Rokusho’s sword and looks fantastic on him. 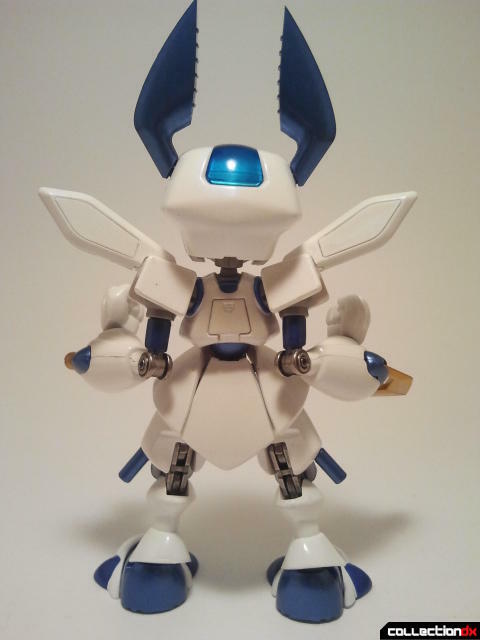 Rokusho is yet another one of those toys that I wished had when I was a kid. His detail and paint are absolutely stunning, and his posability leaves nothing to be desired. Add a little diecast on top of that and you have a near perfect toy. 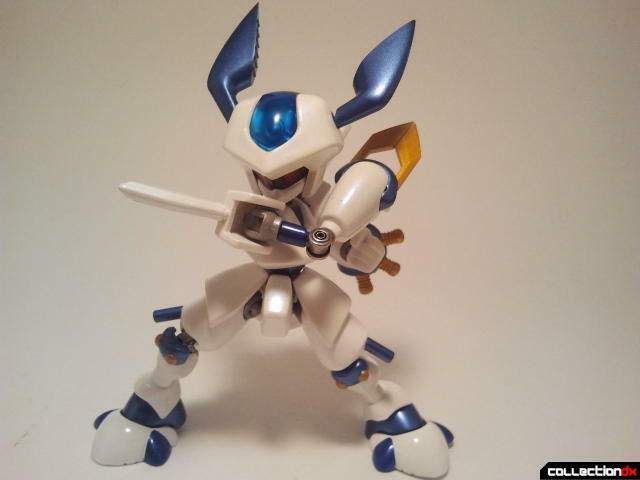 If you love Medabots, or just think robots with swords are cool like I do, definitely check D-Arts Rokusho out. Dramatically throwing off the cape is the best. sweet Ive been thinkn about collecting the old mini figures that you can swap parts on. 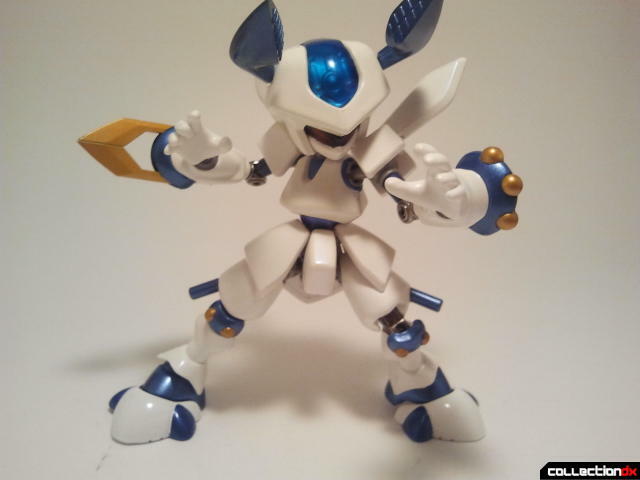 Im rather surprised you dont know about the Medarot figures made by Takara!! They are superior to anything the US made. They were semi model kits. They came with a tin-pet and you put on the armor. Highly possible like this figure. I have both and they are both great in their own way. Nice review btw. Like the action shots! 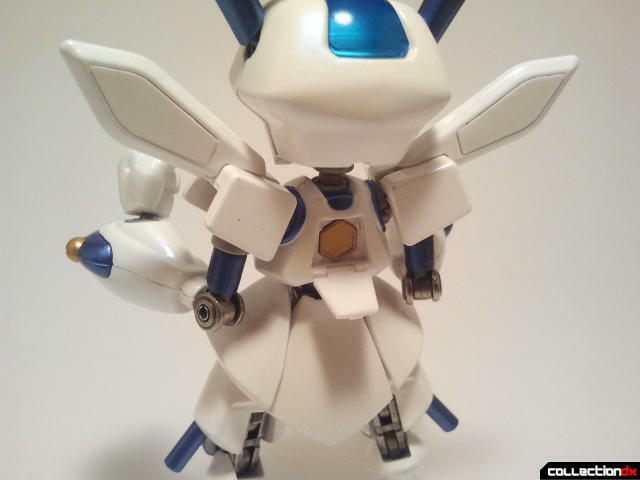 Yeah, I actually remember looking up Medabots on the internet and seeing pictures of those toys. However I had trouble ever coming across them. I would like to get my hands on the Rokusho one for sure though. 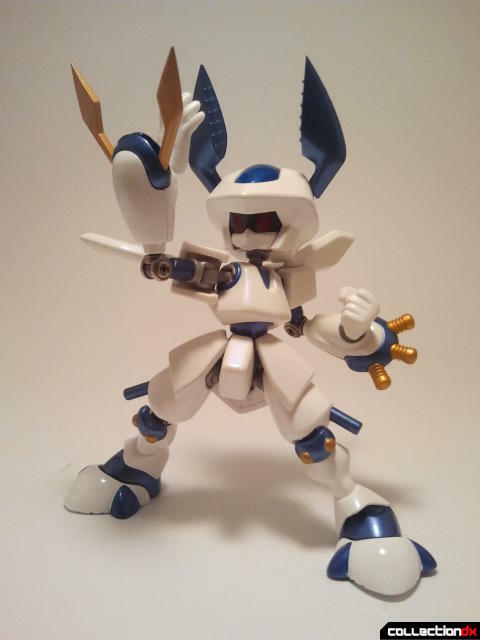 I only have the vaguest idea of what Medabots is (a Pokemon ripoff? 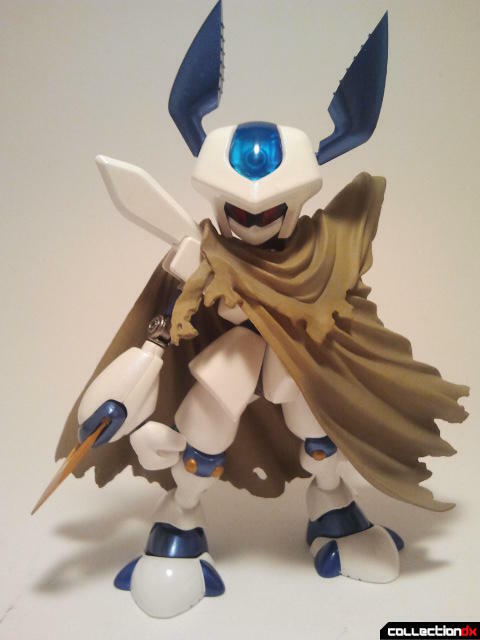 ),and would never care about toys based on it normally,but that cape is BADASS. how big are the model kits? wonder how they compare to the modern D-arts.. I don't have mine anymore, but I remember the model kits being a little bit bigger than the D-Arts. The D-Arts are about 4 inches in height, while I think the model kits were closer to 5 or 6 inches.